A stencil font where the letters have straight edges such as Lintsec, Lorimer No. 2, and Major Snafu which can be found at Font Squirrel for free. In the Tool Options, open the Font Picker and choose a stencil font. I’m using Lintsec, a stencil font you can find for free at Font Squirrel. Set the Size to 100 pts, and the Alignment to Center. In the Tool Options, click on the Type Tool Color Picker and choose a medium gray color. I’m using Hex #: 959595. Click OK.
On the document, click once and type the word LOVE. If the Foreground Color Chip isn’t black, press the letter D to reset the Color Chips to the default of black over white. 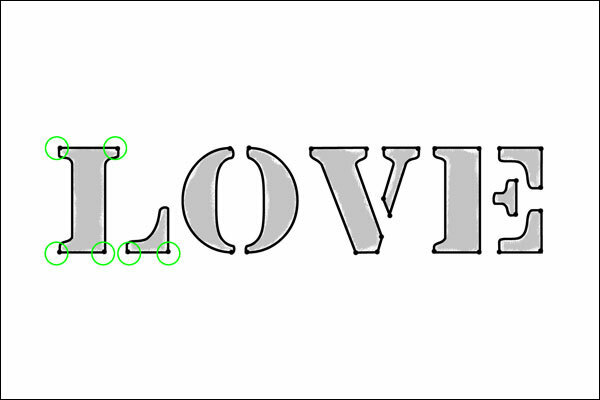 In the Layers panel, Ctrl click (Mac: Cmd click) on the thumbnail of the LOVE type layer to get a selection outline. Set the Stroke Width to 7px. The Color should be black. Set the Location to Inside, the Blending Mode to Normal, and the Opacity to 100%. In the Layers panel, double click on the name of this layer and change it to Stroke Outline. Press Enter to commit the name change. In the Layers panel, click on the Visibility icon of the LOVE type layer to hide it. In the Tool Options, open the Brush Picker and choose the Hard Round Brush from the Default Brushes. If you don’t see the Hard Round Brush, open the flyout menu and choose Large List. In the Tool Options, open the Brush Picker and choose the Hard Round Brush from Legacy > Default Brushes. To see the Legacy Brushes, open the flyout menu and choose Legacy Brushes. Click OK.
To see the name of the brushes, open the flyout menu and choose Brush Name. On the document, click once on each place there is a hard corner along the Stroke Outline. NOTE: If you do not like the placement of one of your ink dots, press Ctrl Z (Mac: Cmd Z) to Undo the last step. Once you have completed your ink dots, in the Layers panel, double click on the name of this layer and change it to Ink Dots. Press Enter to commit the name change. In the Layers panel, Shift click on the Stroke Outline Layer so that both it and the Ink Dots layer are active. If you want to give your hand drawn stenciled word an additional touch, consider adding a stamped effect to the medium gray text layer. In the Layers panel, click on the Visibility icon of the LOVE type layer to reveal it. In the Tool Options, open the Brush Picker and choose the Pastel on Charcoal Paper from the Dry Media Brushes. In the Tool Options, open the Brush Picker and choose the Pastel on Charcoal Paper from Legacy > Dry Media Brushes. Set the Size to 60 px and leave all the other settings the same. In the Layers panel, click on the LOVE type layer so it’s the active layer. Black should be the Foreground Color Chip. If it isn’t, press the letter X. On the document, click and drag the edge of the brush around the edges of the letters. NOTE: The goal is to rough up the edges of the gray letters to give a stamped on look. 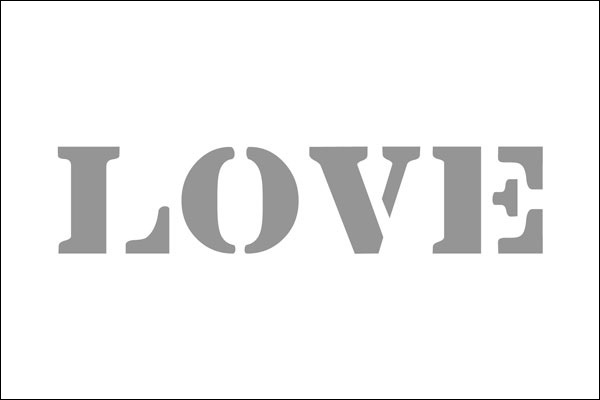 In the Layers panel, lower the Opacity of the LOVE type layer to 60%. Recolor the gray LOVE type layer so it coordinates with your project. To do that, in the Layers panel, click on the gray LOVE type layer to activate it. On the document, sample a color from your project and Click OK.
Press Shift Alt Backspace (Mac: Shift Opt Delete) to fill the type with the foreground color. Consider offsetting the Stroke + Ink Dots merged layer from the stamped layer by using the Move tool and the Arrow keys. To do that, in the Layers panel, click on the Stroke + Ink Dots layer to activate it. Use the Arrow keys to nudge the Stroke + Ink Dots so that it offsets the LOVE type layer. Great tutorial, Jen, and I love how you used it on your page! Very cool how small details can make such a difference on a scrapbook page. Now I’m inspired! Woot! 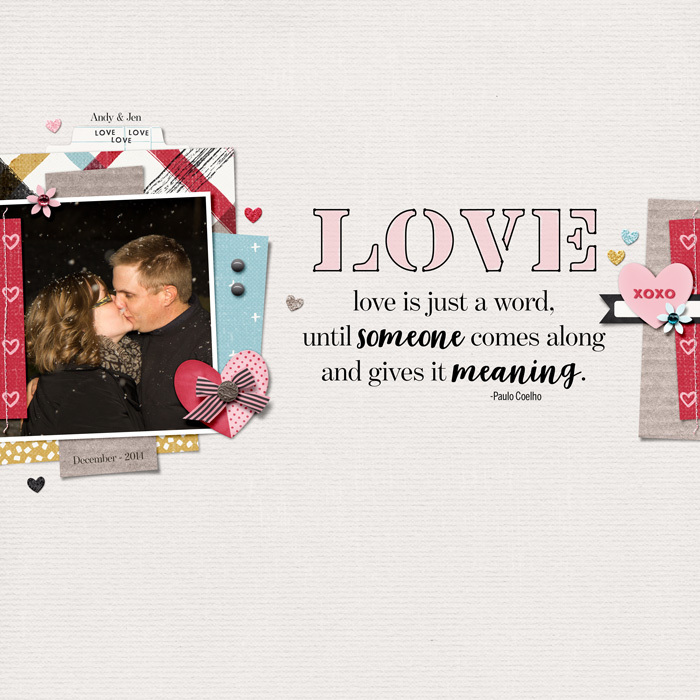 I loved this tutorial – made Valentine’s Day cards using this!